Hello people of the internet!!! With Disney Channel’s announcement of their newest show ‘Girl Meets World’ (a spin-off show of the popular 90s hit ‘Boy Meets World’), I began to think about the “spin-off” trend in television. First in 2003 Nickelodeon premiered its spin-off of the beloved children’s show ‘Rugrats’, which was entitled ‘All Grown Up’ and remained on air until 2008. Then, in 2008 The CW premiered a new version of the 90s teen phenomenon ‘Beverly Hills, 90210’, with a new cast of characters (however some of the actors from the original show guest stared on 90210). So, it’s apparent that “spin-off fever” has become very prevalent in Hollywood over the past few years. I think that this is because we become very emotionally invested in the characters from our favorite TV shows, that we begin to subconsciously think of them as real people, and thus we want to know all about their past and future (oh you know you start thinking of them as real people, don’t pretend like I’m the only one…I thought so). Although many great shows have had spin-offs (and occasionally prequels), I have made a list of 10 shows that I think deserve a chance to live again. If I’ve missed any shows, please let me know in the comments below! The thing that I always liked about this comedy, was how the characters dealt with real life issues, along with the primary storyline of two twin sisters who meet unexpectedly after being separated at birth. This show catapulted Tia & Tamera Mowry into superstardom, which led them to star in numerous other projects both separately and together. I think that it would be very interesting to see how the characters developed as they grew up, and how they ended up relating to one another as adults. From 2001-2004, the world was reintroduced to country singer Billy Ray Cyrus, as the kind hearted and wise doctor ‘Clint Cassidy’ on ‘Doc’. On the show, Cyrus’ character dealt with personal, moral, and ethical issues; as well as the common politics found in the professional world. The show was full of complex relationships, interesting twists, and very relatable characters, so I think that it would be really interesting to see where their lives led them. This show was a HUGE hit for Disney Channel in the early 2000s, and become a very successful franchise which included: clothing, fashion accessories, toys, a movie, and numerous other products, which became very profitable for the Disney Corporation. This show also launched the career of Hilary Duff, and quickly made the young girl a household name. The show ended at the end of the summer, right before the main characters where going to enter high school. The success of this show paved the way for numerous other young actresses to have successful careers in music, fashion, etc. This long running family drama revolved around the lives of the Camden family. The Camden family was a typical middle class family, who dealt with real life issues and triumphs in the town of Glen Oak, California. The father character on the show Eric Camden, (who was portrayed by Stephen Collins) was a protestant minister, whose large heart often placed him and his family in interesting situations. This show explored various social, economical, and ethical themes, which evolved over the years to keep in tune with our ever changing society. I think that the plot lines and character development were so impressive, that a spin-off of this show would have success for a numerous amount of years, and would grow with a generation the way 7th Heaven did. This show (which starred comedian/actor George Lopez), showed the reality of a middle-class Hispanic family living in California. As the majority of the shows on this list do, this show explored real-life issues however; it also explored the plight of what working class individuals go through, when they move up the cooperate ladder. Although this show was not extremely popular when it originally aired, its ratings have done extremely well in syndication. I believe that due to how popular the show has become since its original run ended, along with the growing popularity of George Lopez, (due to his involvement with the Disney ‘Beverly Hills Chihuahua’ franchise), that this would be the perfect time for a spin-off to happen. George Lopez now has voice recognition credibility, so even if some people don’t know how he is, they will recognize his voice, and be attracted to the sitcom. ‘Home Improvement’ was a family sitcom, (which starred actor Tim Allen), which revolved around the lives of a man named Tim (who was the host of a home improvement show, where he also sold tools for a fictional tool company called ‘Binford Tools’),his family, his best friend, and his neighbor. Tim was a very cocky man, whose pride often got his family into crazy situations. This sitcom made a large amount of the cast into household names, and led to numerous other projects during, and after the show originally aired. I think that a spin-off of this show would do very well, due to the original team’s excellent casting choices and witty scripts. This long running situational comedy starred (and was co-created by) comedian Jerry Seinfeld, who portrayed a comedian named Jerry on the show (talk about life imitating art). Jerry had three close friends on the show: George ( his best friend, whose extreme penny pitching ways and jealously of others, often got him into extremely uncomfortable situations), Elaine (his ex-girlfriend who is often too honest for her own good), and Kramer (Jerry’s eccentric neighbor, who often slid through Jerry’s door as his way of entrance, and was very abrasive of Jerry’s personal space). I believe that this show was so popular, because it resonated with the general public due to its dry and subtle humor. This show presented a model of comedy that had not previously been explored, and thus opened a new market in television, that has continued to be used ever since. This highly acclaimed show, consisted of an ensemble cast, who portrayed 6 friends living in New York City, who dealt with the ups and downs of adult life. The characters had numerous entanglements among each other, which often were the cause of several interesting situations. Ever since the show ended its original run, fans of the show have asked for its return, so I think that it’s easy to see why a spin-off of the show would be a huge success. This show also launched the careers of all of the cast members, although some have had more fruitful careers than others, all 6 members of the cast have had career opportunities because of the show’s popularity. Although this show did have a short lived spin-off, I believe that the show’s continued popularity, would make a second spin-off a profitable investment. There is no question that this family comedy has had amazing success in syndication, and thus certainly warrants a spin-off. This show revolved around the life of single father Danny Tanner (Bob Saget), who asks for the aid of his best friend (Joey) and brother-in-law (Jesse) , in raising his three daughters, once his wife passes away. Joey and Jesse soon become pseudo fathers to the girls, and continue to become essential members of the family for the shows entire run. This show starred John Stamos and Bob Saget, who were already successful entertainers in their own right, and launched the careers of the various other cast members, most notably, Mary Kate and Ashley Olsen (who portrayed the youngest daughter Michelle). Now we’ve reached #1 on our list!!! Although many of the other shows mentioned on this list could have easily been #1, I chose this show because of its ability to transcend through the decades, and remain relevant. This sitcom starred famous comedian and all around entertainer Bill Cosby, as a good natured New York doctor named Heathcliff “Cliff” Huxtable, who had a tendency to exaggerate, and tell tall tells. The cast was rounded out with Cliff’s wife Claire (a successful attorney), and his 5 children. The show dealt with more intense and difficult topics as the children on the show grew up however, the show was essentially a family sitcom, so the topics never got too out of control. The Cosby Show has continued to be a syndication success even though it has been two decades since the show went of air. Although this show has already had a spin-off (called ‘A Different World’, which aired form 1987-1993), I believe that the original show has been off air long enough to warrant a second spin-off. Additionally, this new spin-off would be much more successful than A Different World, because it would not be in direct competition with The Cosby Show, like A Different World was. *All photos and information used in this blog belong to imdb.com, Disney Channel, April Kelly, Michael Jacobs, ABC, Nickelodeon, Paul Germain, Gabor Csupo, Arlene Klasky, Darren Star, Aaron Spelling, E. Duke Vincent, Kim Bass, Gary Gilbert, Fred Shafferman, Tia Mowry, Tamera Mowry, David Alan Johnson, Gary R. Johnson, Billy Ray Cyrus, Hilary Duff, Terri Minsky, Stephen Collins, George Lopez, Brenda Hampton, Bruce Helford, George Lopez, Robert Borden, Jerry Seinfeld, Tim Allen, Carmen Finestra, David McFadzean, Matt Williams, Larry David, Jerry Seinfeld, Bob Saget, Mary Kate Olsen, Ashley Olsen, John Stamos, Jennifer Aniston, Courtney Cox, David Crane, Marta Kauffman, Bill Cosby, Jeff Franklin, Ed. Weinberger, Michael Lesson, studentsoftheworld.info, allthetests.com, fanart.tv, starburry17.com, buzzsugar.com, sitcomsonline.com, and all other original owners. I do not own anything in this blog. All opinions expressed in this blog are my own. I wrote this blog for entertainment purposes and no copyright infringement is intended. celindareyesblog June 23, 2014 No Comments on Monday Memos: Shows that deserve a spin-off series. Category: Monday Memos. Tagged: 2000s, 7th heaven, 90s, actress, all grown up, ashley olsen, beverly hills 90210, beverly hills chihuahu, bill cosby, billy ray cyrus, bob saget, boy meets world, california, career, cartoon, channel, comedian, comedy, courtney cox, cw, cyrus, disney, doc, dry humor, entertainment, family, film, franchise, friends, full house, george lopez, girl meets world, great, hilary duff, home improvement, jennifer aniston, jerry seinfeld, john stamos, lizzie mcguire, mary kate olsen, middle class, mowry, new york, rugrats, seinfeld, shows, sister sister, sitcom, situational comedy, spin-off, superstar, tamera, the cosby show, tia, timallen, tv. 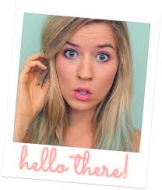 YouTube Wednesday: meghanrosette, the witty beauty/fashion/lifestyle guru that you will want to be BFFs with!!! Home | YouTube Wednesday | YouTube Wednesday: meghanrosette, the witty beauty/fashion/lifestyle guru that you will want to be BFFs with!!! Hello people of the internet, please allow me for a moment to paint a picture for you. A 16 year old girl receives news one summer from her doctor that she has mono, so she must begin bed rest. Now usually teenagers spend the summer time hanging out with friends, going on trips, swimming, etc.. So what can a 16 year old do during the summer for fun if she’s stuck at home? Well if you ask the girl behind the extremely popular YouTube channel ‘meghanrosette’, you start a career launching YouTube channel. Meghan Rienks, (whose last name isn’t actually Rosette, the name was created because Meghan’s middle name is Rose) was born on August 4th, 1993 in a city near San Francisco, CA. Meghan has said that she was a “dramatic” child, and officially caught the acting bug after a 3rd grade production of ‘The Wiz’ (where Meghan played a munchkin…o.k. everyone say it with me…awwwww…I’m mean seriously a 3rd grader playing a munchkin, that is just too cute!). Meghan then began taking acting, voice, and dance classes in order to further explore her love of performing. She began experimenting with makeup in the middle school, and continued acting.. Once Meghan entered High School, she soon began performing in numerous school plays. However, Meghan’s most important high school activity would occur the summer before her senior year, when Meghan contracted mono from sharing a soda can with her friend. Although most people would hide in their room and cry over this, Meghan took the advice of her mother, and began a YouTube channel. So, on June 16th, 2010 the channel ‘meghanrosette’ was born, and Meghan’s life was forever changed (Here’s Meghan’s 1st video where she does a fashion haul with one of her friends: Haul with dancer4life34! – YouTube). On the surface, Meghan’s channel seems like that of any other young guru however, once you watch just a few minutes of any of her 412 videos, you can see that this girl is anything but ordinary. Meghan is not openly knowledgeable about fashion trends, beauty secrets, and everyday life issues, but she also has a charisma and ease on camera that instantly draws you in. She is also extremely witty and goofy, which makes her very relatable, and only adds to her overall charm. I first discovered Meghan a few months ago when I saw her on an episode of the hit show IMO (which stands for In My Opinion), on the super popular AwesomnessTV YouTube channel. On IMO, Meghan is on a rotating panel, where the panelists discuss a wide variety such as; fashion trends, celebrities, relationship/friendship issues, etc. (basically it’s a teen/young adult version of ‘The View’). When I first saw Meghan on IMO, I instantly found her very interesting and funny, and wanted to learn more about her. After I watched a few of her videos, I could see why she (as of December 10th, 2013) has 535,602 subscribers on her channel. Meghan is not only adored by her large fan base, but has also grabbed the attention of many important fashion and beauty publications. She has been featured in magazines such as Teen Vogue and Seventeen. Meghan has also interviewed celebrities and has done red carpet coverage for Seventeen magazine (here’s a video of Meghan interviewing Ashley Rickards, the star of MTV’s popular show ‘Awkward’: My First Time Tag with Ashley Rickards – YouTube). Along with working on her growing YouTube career, Meghan has also continued acting, and was recently on the hit AwesomnessTV show. She also stars on the YouTube show ‘The Goreys’, as Abigail Gorey (here’s a link to the first episode: Hello Dr. Jacobs – Episode 1 – YouTube). Because of all of these amazing accomplishments that she’s had in such a short time span, I would definitely recommend that EVERYONE keep an eye on Meghan, she will definitely be a huge star soon. Another reason why I highly recommend Meghan’s channel, is because she is very open and honest with her fans. In her ‘Draw My Life’ video (here’s the link to that video:Draw My Life | MeghanRosette – YouTube), Meghan admitted to having insecurity issues in middle school due to her appearance, and also stated that her elementary school friends shunned her because they were popular and she was not. Meghan has also spoken about the bullying she received from her two best friends in college. She admits that she became anxious, OCD, and suffered a great depression because of what occurred between her and these friends. Although Meghan says that she is in a better mental state now, I think that it was very brave that she decided to reveal some of the struggles she has faced. Her story is truly inspiring, and proves that you can do whatever you set your mind too as long as you follow your dreams and ignore any haters. I think Taylor Swift said it best in her song ‘Ours’, when she states, “People throw rocks at things that shine…”. Due to her bubbly personality, natural charisma, and wit, I certainly see a bright future ahead for Meghan in vlogging and acting. Keep on shinning girl! celindareyesblog June 22, 2014 No Comments on YouTube Wednesday: meghanrosette, the witty beauty/fashion/lifestyle guru that you will want to be BFFs with!!!. Category: YouTube Wednesday. Tagged: abc, acting, actress, ashley rickards, awesomnesstv, awkward, beauty, bigmachinerecords, bubbly, california, charisma, clip, dance, ease, entertainment, everyday, everyday issues, goreys, guru, IMO, internet, interview, issues, liamariejohnson, life, magazine, meganrosette, mtv, natural, ours, performer, personal, personality, popular, queen bee, red carpet coverage, seventeen, sideeffects, taylorswift, teenvogue, the view, the wiz, trends, videos, vlog, voice, wednesday, wit, youtube. Hello people of the internet!!! On today’s ‘YouTube Wednesday’, we’re going to discuss a scenario that I think we’ve all been in. It’s the day after Thanksgiving; you wake up and suddenly regret all the slices of pie, turkey, stuffing, mashed potatoes, etc., that you ate the day before (Yes, you right there). Once you’ve come to this realization you start stressing out about finding the time to go for a jog or braving the elements to travel to a gym. Well don’t worry! I found a great YouTube trainer that will have you feeling regret free this holiday season (YES!!!!!! Cookie time!). Ready? Ok, here we go! Certified Pilates and fitness instructor Cassey Ho (or blogilates, as she is more commonly known as) posts Pilates videos, in which uses the energy of popular Top 40 radio hits to make the exercises fun. Cassey currently has 936,992 subscribers, and 74,292,068 views on YouTube, she also teaches POP Pilates in person at the Equinox Fitness Club in Los Angeles, CA. Along with her Pilates classes, Cassey also designs and markets various Pilates themed workout clothes, equipment, and a DVD, some of these products have even been featured in SHAPE magazine and on The Wendy Williams Show. As if these accomplishments are not enough, Cassey was also named the Best Healthy Living Blogger of 2012 by FITNESS magazine, and the #2 most influential online personality by Sharecare ( she was only beaten out by reality show fitness guru Jillian Michaels…good job Cassey, you go Glen Coco!). Her blog site also has various true stories of people who have transformed their bodies using Cassey’s methods. I thought this was a really cool idea because losing weight or toning up can often be a hard and grueling process, so seeing other people’s success can often encourage you to stay focused on your own fitness goals. I’ve personally tried many of Cassey’s workouts, and I can tell you that they’re HARD…but they are very rewarding, so I would definitely check out Cassey’s videos and her blog. Now even though there are many, many, MANY, different types of videos on Cassey’s YouTube channel, I did find some videos made specifically for Thanksgiving, so I’ll post links to those videos below, but I suggest you check out all of her videos. Well…what are you doing? Go look at the videos, you can do it, I believe in you! Thanks for reading this post and until Friday, bye!!!!!!! celindareyesblog June 22, 2014 No Comments on YouTube Wednesday: Post Thanksgiving Pilates Workouts. Category: YouTube Wednesday. Tagged: awesome, blog, body, california, cassey ho, clean, clothes, eating, entertainment, equinox fitness club, equipment, fitness, food, glen coco, guru, hard, healthy, jillian michaels, los angeles, pictures, pillates, pop pilates, recipes, rewarding, shape magazine, shorty awards, slimming, thanksgiving, toning, trainer, true stories, videos, weight, youtube.